Family run, Blackpool-based Weru UK – a distributor for Weru – Germany’s market leader in windows and doors, is consolidating its business with major geographical expansion, following a significant licensing deal with Weru Group Germany. The business based at Amy Johnson Way, Squires Gate and established 33 years ago, now serves a UK wide client base, and to strengthen its operation it’s launching the Weru UK Network. This notable move is expected to take the new UK group sales from approximately £4.5 million annually of ‘installed windows and doors’ to over £8 million in 2020. Managed and supported from the heavily invested-in national support centre at their impressive 8000 ft2 Blackpool site, the Weru UK Network will see accredited partners, once fully vetted and trained to the highest standards, offering developers and home owners in a specific catchment, a complete windows and doors solution. The family business was established in 1985 and Graham Lindsay still heads up the operation along with his daughter Kate, and their professional team that have amassed significant experience in making continental windows reach their true potential within UK homes and commercial buildings. 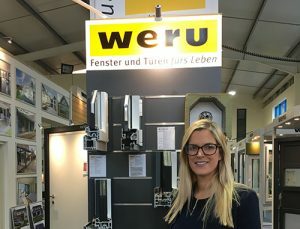 Weru UK will be showcasing the Weru UK Network to potential partners from the window industry at the FIT Show at the NEC, being held 21-23 May.